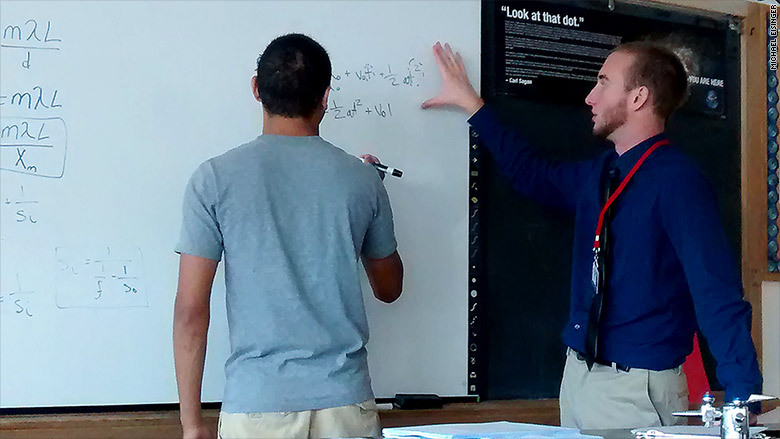 First-year teacher Michael Eisinger is shown instructing an AP Physics student. He landed his dream job in Sauquoit, New York, teaching at the same high school he graduated from as a valedictorian. And he's thrilled. Eisinger is starting his career in the midst of a teacher shortage that has left districts across the country struggling to fill positions. From 2010 to 2014, national enrollment in teacher prep programs dropped 30%, and completion of those programs dropped 17%. In California alone this year, there were 21,500 job openings for teachers. With the profession of teaching struggling, CNNMoney has decided to follow Eisinger throughout his first year. "I'm so excited to start," he told CNNMoney in August. "I'm even excited for the superintendent's conference days and new-teacher orientation." CNNMoney spoke with him again on September 8 -- his first day of school. "Overall, it was a great first day! It went well and it was nice to see the students and interact with them," he said. Day one was spent administering pre-tests and handing out his syllabus, so Eisinger said he couldn't wait to really delve into the material with his students. This year he'll be teaching three different science courses with relatively small class sizes. He has nine students in AP Physics, 19 and 13 in two sections of Regents physics, and seven in non-Regents Earth science. Related: Teach for America applications decline again. Sauquoit Valley Central Schools is a small district with only 1,024 students and three schools: an elementary, middle and high school. Eisinger started there as a substitute teacher more than three years ago. As a first year teacher, Eisinger will make about $38,500. That's a lot less than the average national salary for public school teachers, which was $56,383 during the 2012-2013 school year, the most recent data available. But Eisinger explained that the cost of living in Sauquoit is fairly low and added that it's only his first year. He said his salary is "good enough for a single person to live comfortably," but acknowledged that he still lives at home. Related: Chicago school district has over 1,450 teacher openings. Eisinger, who graduated in 2014, began subbing in Sauquoit when he was a junior at SUNY Geneseo. He'd always loved school and knew early on that he wanted to learn the family trade -- five of his mom's six siblings are teachers. But he wasn't sure what he wanted to teach. "Science was never my favorite subject in school, until I was in AP Physics and there was this one question that I just couldn't do -- it was ridiculously hard. After about 20 or 30 minutes I finally finished it and when I checked the answer it was right," he explained. "I know it sounds silly, but I was so giddy that I'd gotten it right that I fell in love with physics and wanted to make others feel the way I had."